Chapter headings and selected papers: Plenary Papers. Adaptive control: towards a complexity-based general theory (G. Zames). Invited Papers. Design of Low Complexity Robust Controllers for Uncertain Systems. Robust identification and control of scanning probe microscope scanner (A. Daniele et al.). Tools for Robustness Analysis of Control Systems with Structured Uncertainties. 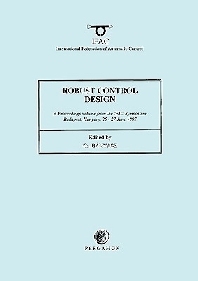 Design and analysis of robust control systems in PARADISE (W. Sienel et al.). Software Tools For Robust Control Design. Robust Optimizmation (L.El Ghaoui). Technical Papers. Robust Stability. Real axis nonsingularity concept for checking robust stability of interval parameter matrices (R.K. Yedavalli). LMI and Convex Optimization. Optimal guaranteed-cost control with pole placement for uncertain systems: An LMI approach (S.H. Esfahani et al.). H∞and L1 Optimal Control. Robust controller design of multivariable systems via eigenstructure assignment (G.P. Liu, R.J. Patton). Robust Nonlinear Control. Sliding mode design for two mass system based on reduced order model (P. Korondi et al.). Robust Performance. Interplay between robustness versus control and identification performances (L. Keviczky, C.S. Bányász). Robust Control Applications. System identification with orthonormal basis functions: an application to flexible structures (V. Nalbanto&gbreve;lu et al.). H∞Filtering. Guaranteed-cost prediction of discrete-time systems: the finite-and infinite-horizon case (P. Bolzern et al.). Identification and Control. Iterative LQG controller design in uncertain parameter system (P. Gáspár et al.). &mgr;-Analysis and Synthesis. Robust position and speed control of variable displacement hydraulic motors (H. Berg). Adaptive Control. Indirect model reference adaptive PIP control (J. Kovács et al.). Fault Detection in Uncertain Systems. Robust control for actuator failures (M. Vîn&abreve;toru et al.). Author index. These proceedings contain papers presented at the IFAC Symposium on Robust Control Design (ROCOND'97) held in Budapest, Hungary between 25-27 June 1997. The Symposium was sponsored by the International Federation of Automatic Control (IFAC) and was organized by the Computer and Automation Research Institute of the Hungarian Academy of Sciences. It consisted of 3 plenary papers, 15 invited papers and 65 technical papers. Topics covered included design of low complexity robust controllers for uncertain systems, software tools for robust control design, robust stability, nonlinear control, performance and control applications.